Friday again, the weeks sure are marching on, October next week and the clocks go back. 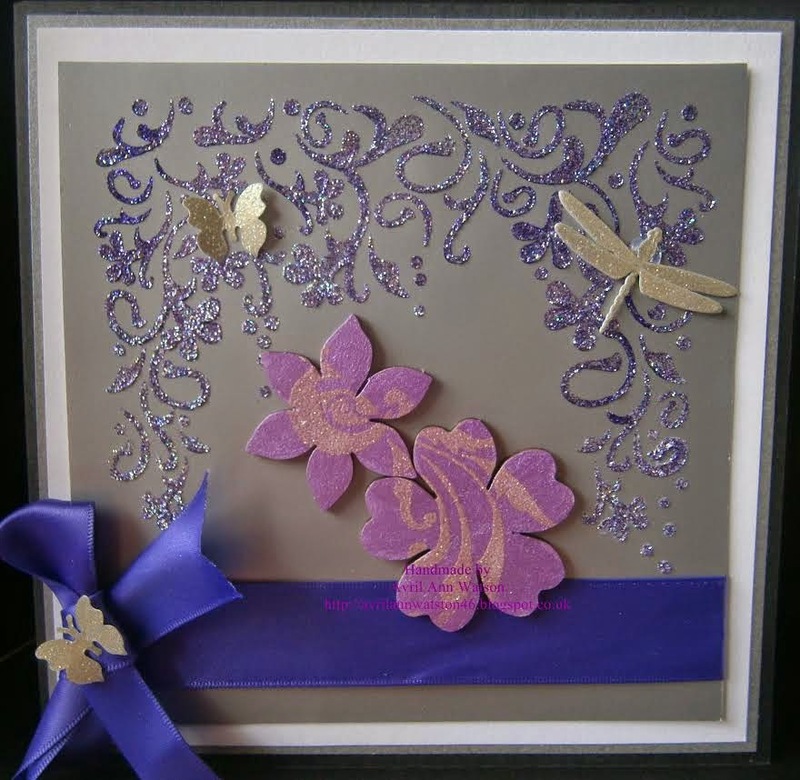 Today we have a beautiful tutorial by Avril to share with you all. 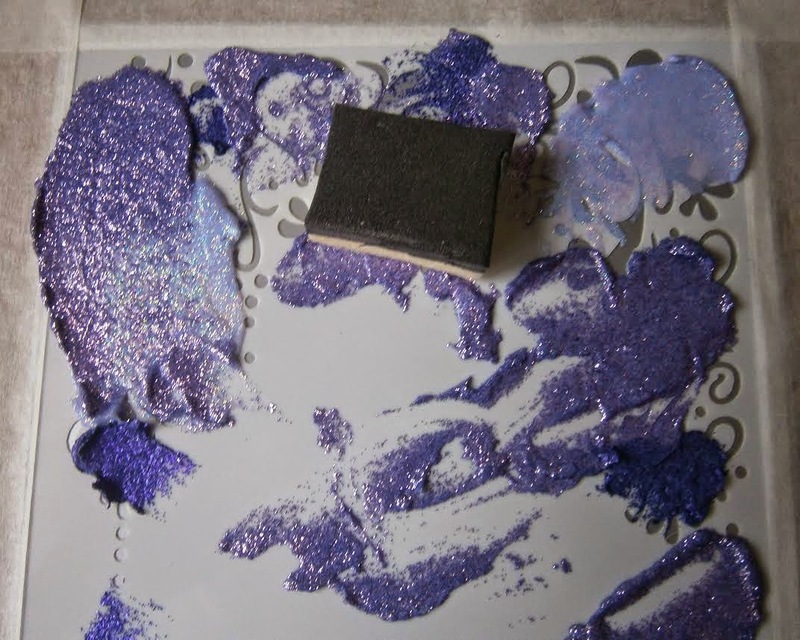 Mask off, Stencil and collect Sparkle Medium you wish to use for this, these are the colours used on this tutorial Soft Purple, Amethyst, and Lavender. 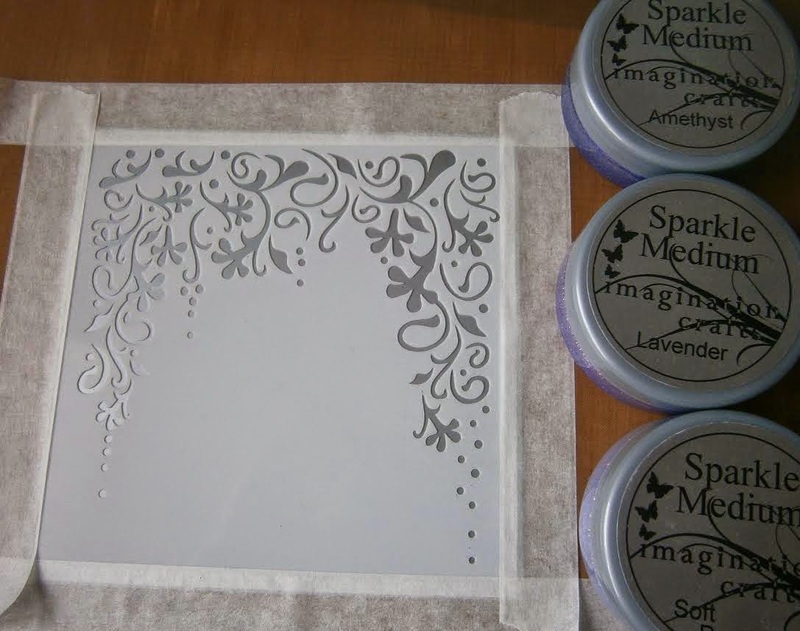 Once dry matt and layer onto white and silver card, wrap ribbon around base and make a bow. Add the floral charms and butterflies/dragonfly to finish off. 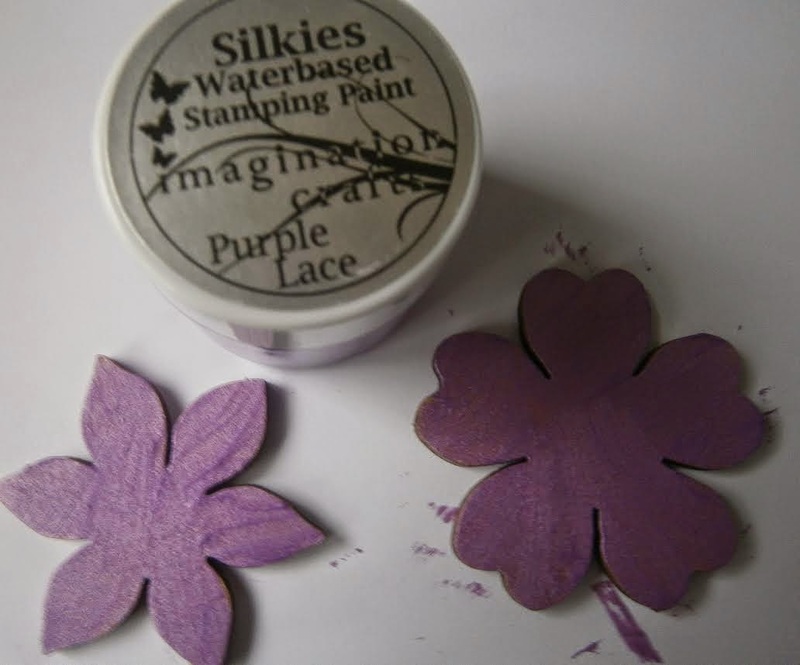 Today we are sharing Jennifer's beautiful tutorial with you all. 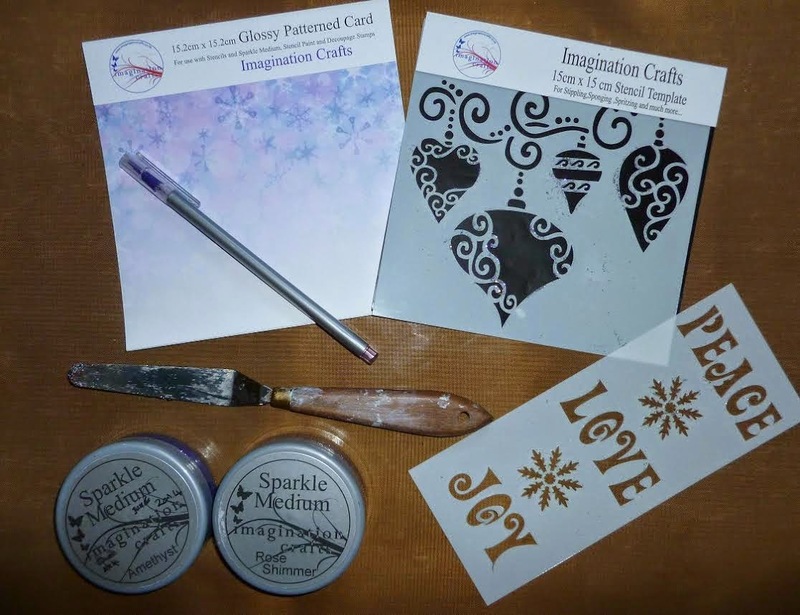 These are the products you will need to make this card. 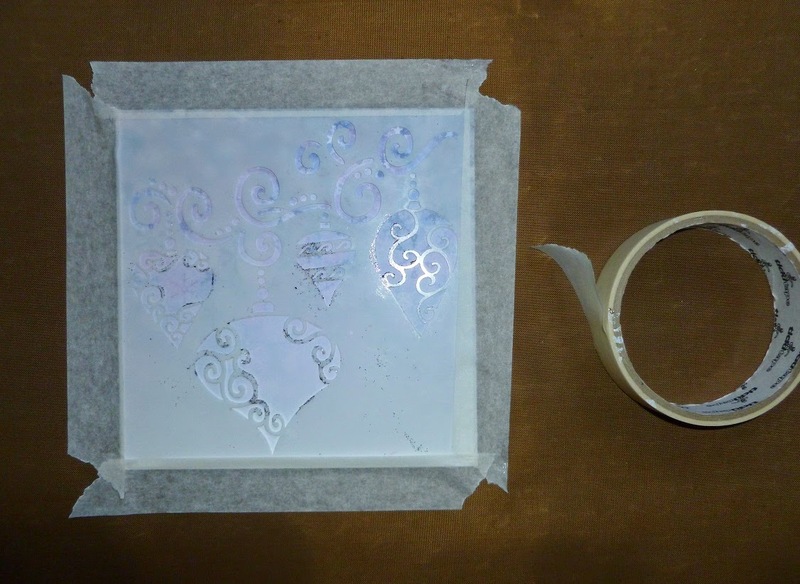 Lay the bauble branch stencil on top of the patterned card and secure to your card and worktop, using some masking tape. 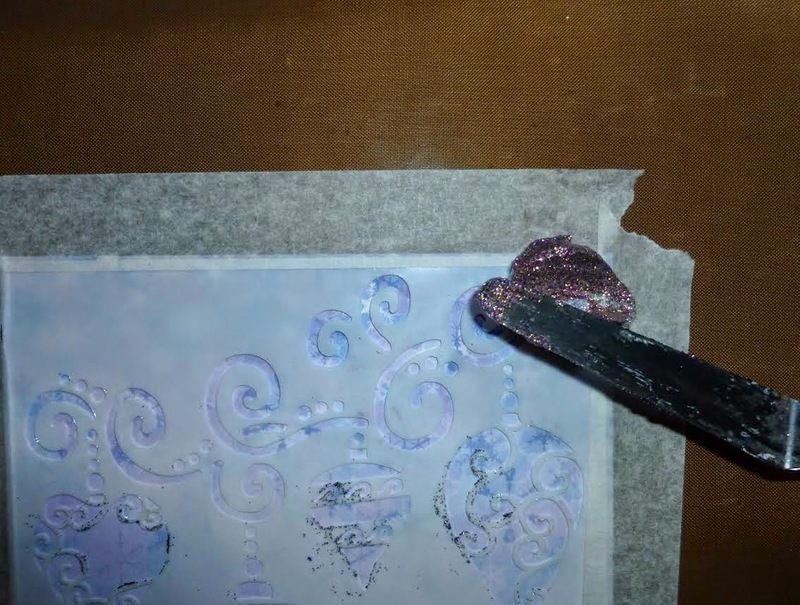 Spread both sparkle mediums over the design using the metal spatula. 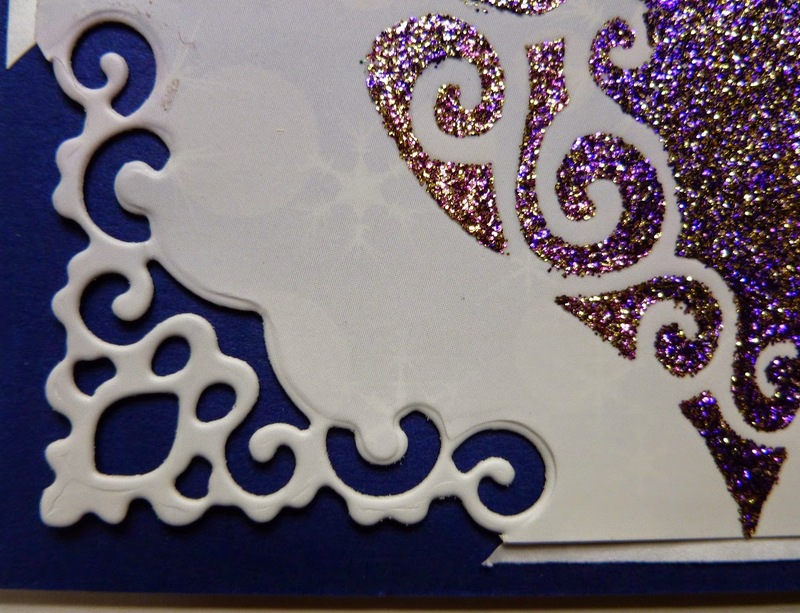 Make a base card from navy card stock. Matt a slightly smaller piece of white card with the bottom left corner cut away, onto the navy base card. 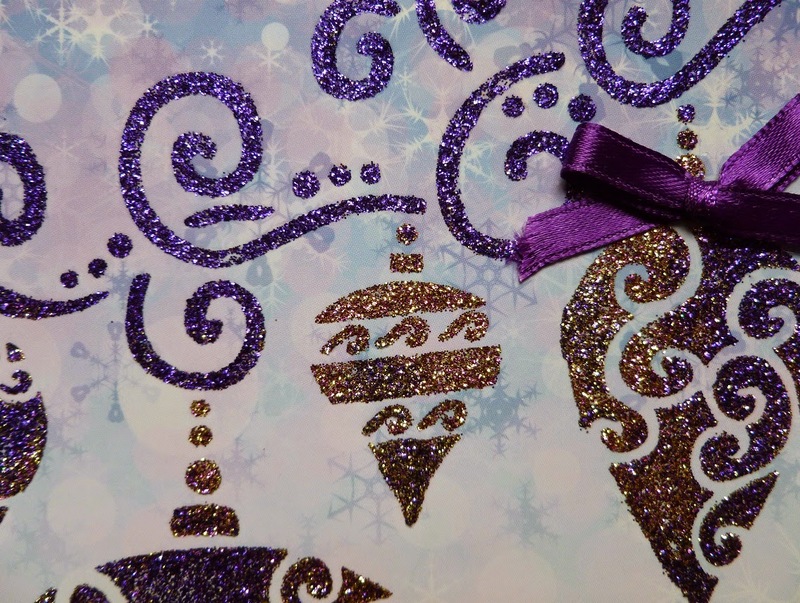 Take the patterned card, 'purple snow' and cut and emboss the bottom left corner using a die-cutting machine and the corner die. When dry matt onto the base card using double sided sticky tape. The navy card should be showing beneath the die-cut corner. 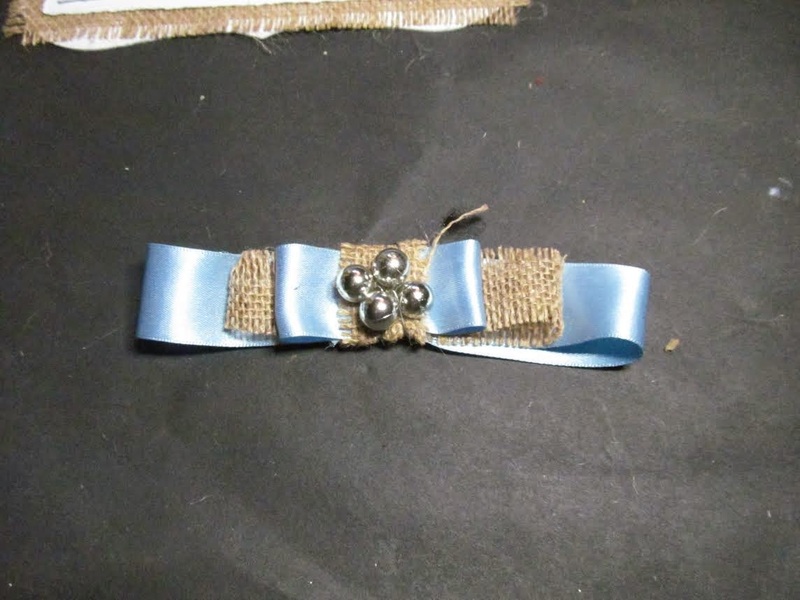 Add a purple ribbon bow to the top right bauble. 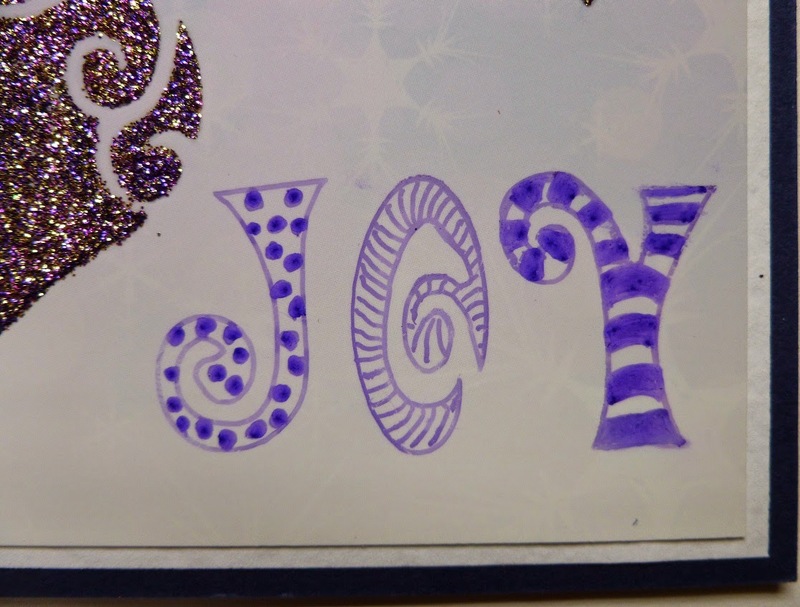 Lay the ' love', ' joy', ' peace' panel stencil so that the 'joy' is in the bottom right hand corner of the card and trace around the outline of the word 'joy,' using a fine purple pen. 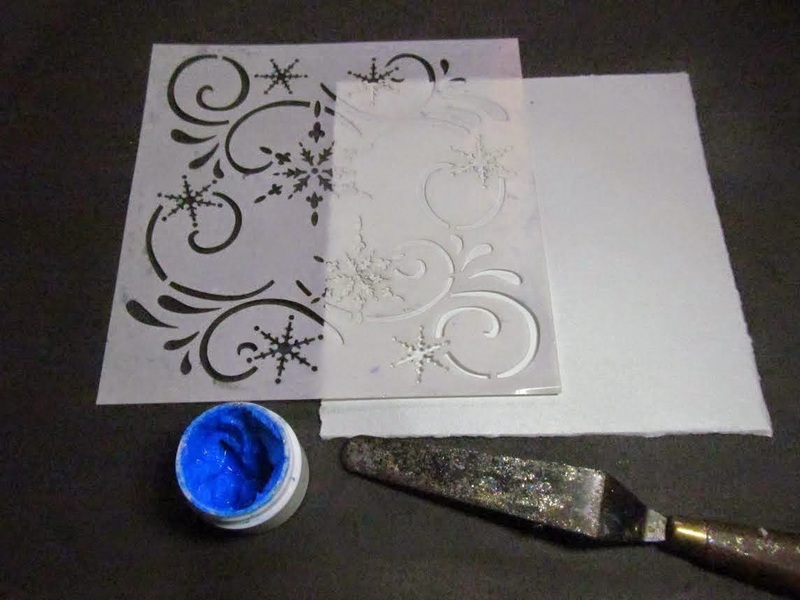 Remove stencil and fill in the letters with your own patterns. Here is your finished card. We hope you all enjoy the show on Friday and the lovely techniques Sue showed us. 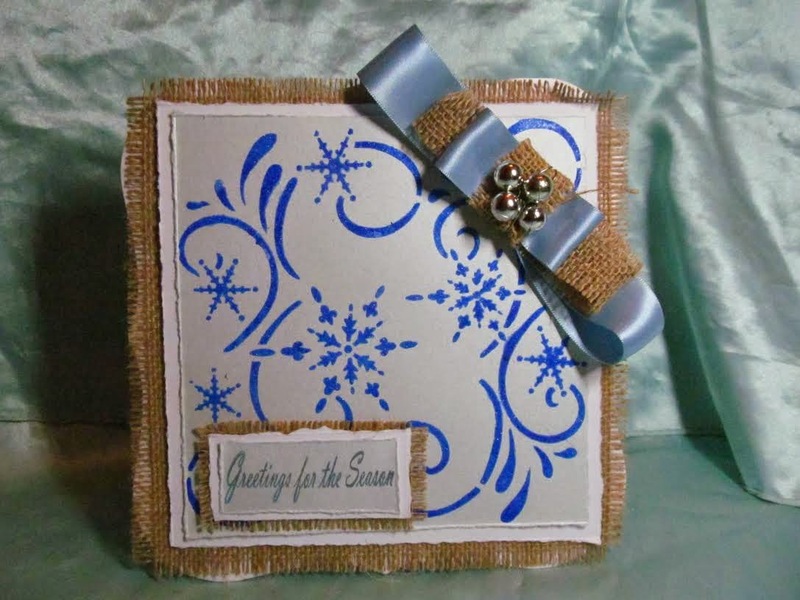 Today we have a tutorial by Lindsay a Christmas card. 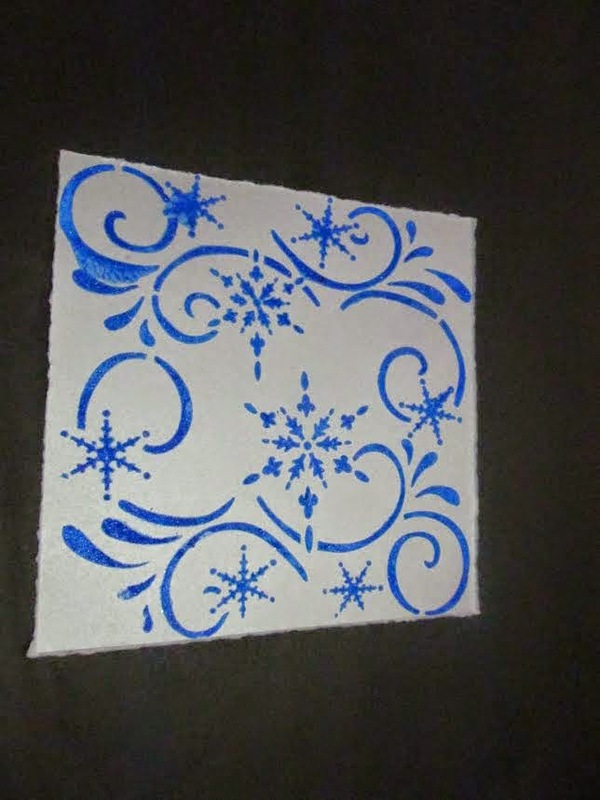 Take a piece of ice blue shimmer card and tear it to measure six by six square, mix Sparkle gel with blue ink and using the Snowflake Flurry stencil spread the Sparkle gel through the stencil on to the card stock using a palette knife. 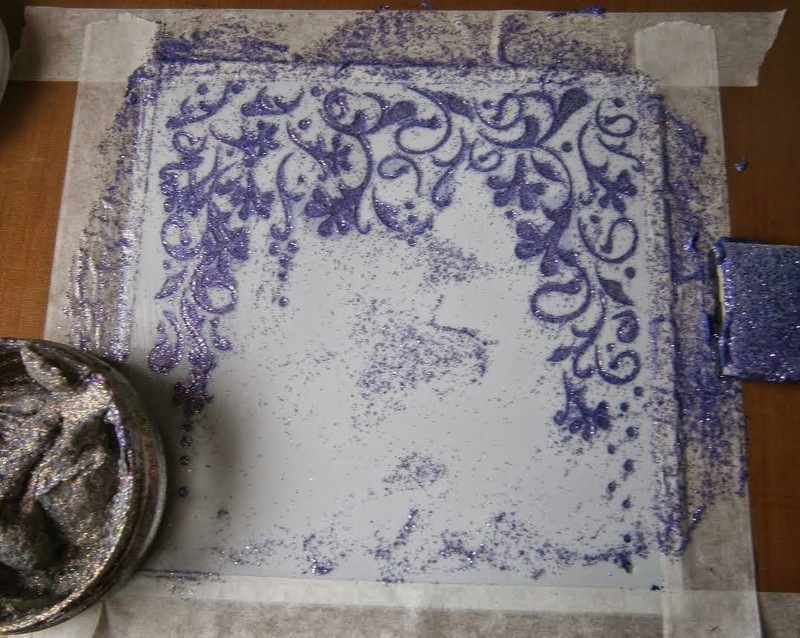 Next stamp a sentiment from the Owl decoupage stamp set on to more of the shimmer card. 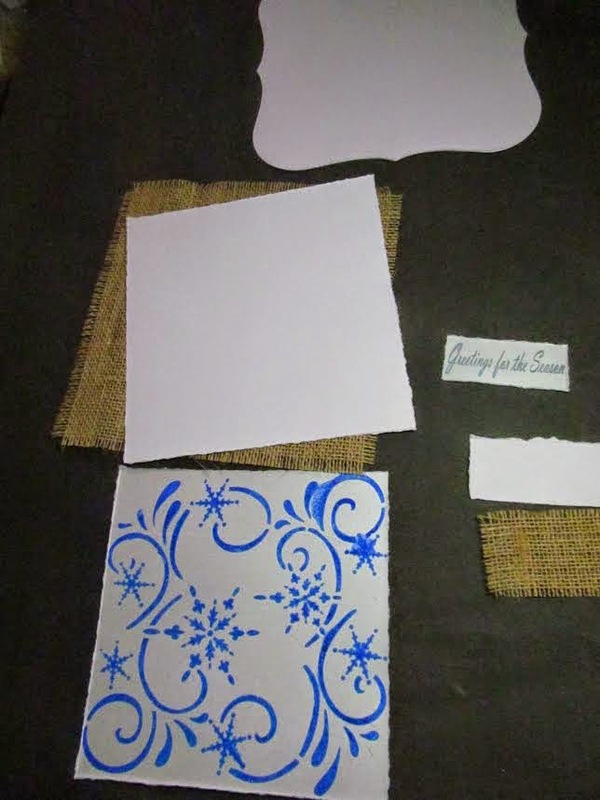 Then cut out a card blank using a large die and create layers from white card and Hessian fabric to matt and layer the card. 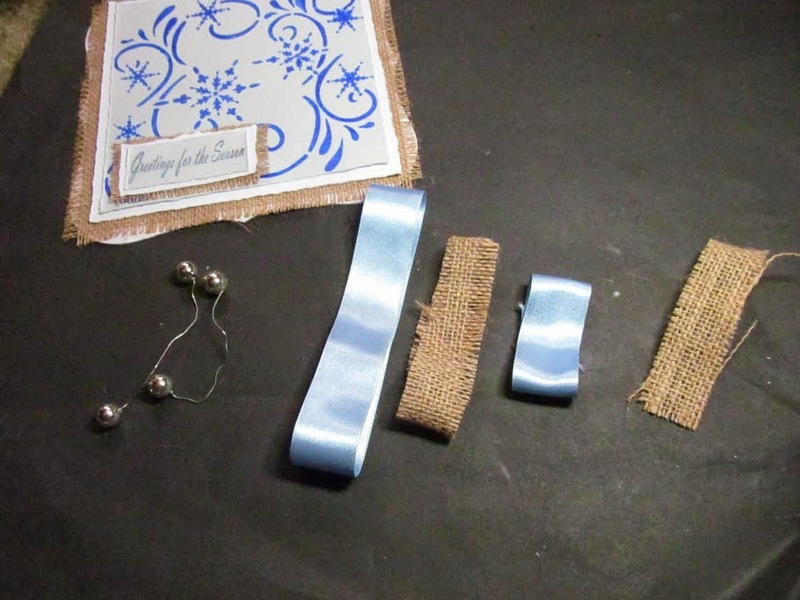 Layer the pieces of the card together and cut out two strips of the Hessian and two strips of blue satin ribbon, cutting the lengths so that they decreased in length alternating between the ribbon and Hessian. 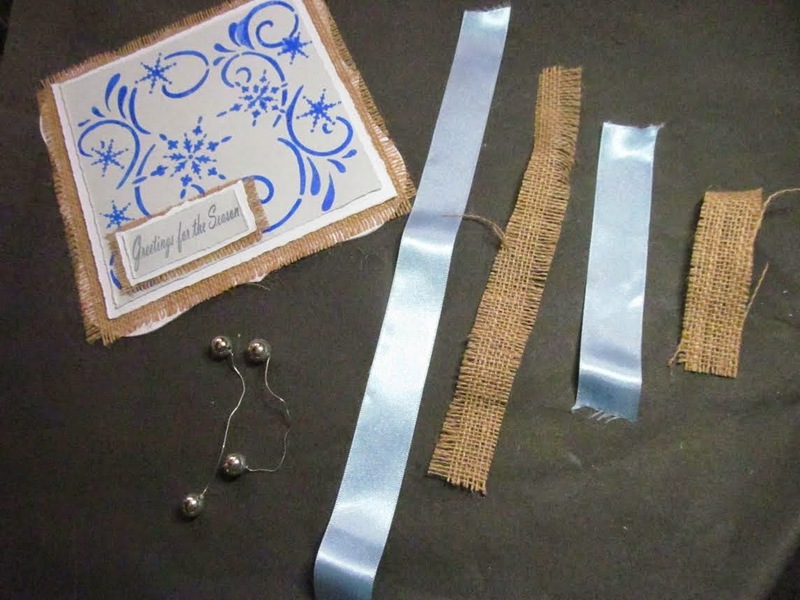 Take the 3 largest pieces of ribbon and Hessian sticking the ends together to make loops and then putting a dab of glue in the middle of each so that you have 3 figure 8 shapes. 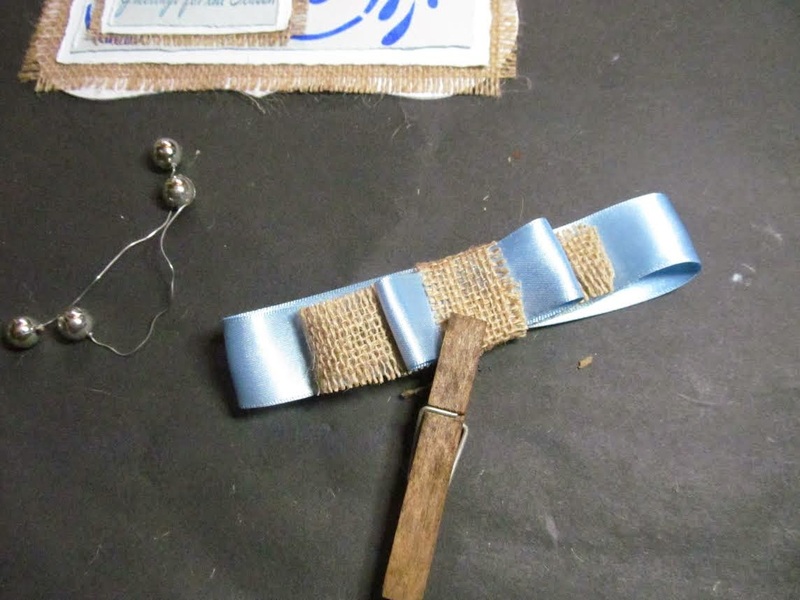 Stick loops on top of one another and used the final smallest piece of Hessian to wrap around the middle, gluing it in to place and securing it with a wooden clothes peg until the glue dried. Finally, when the glue had died take the little baubles on wire (which were salvaged from the ends of last years xmas crackers) twisted them around the centre of the bow and then stuck the bow in to place on the card. 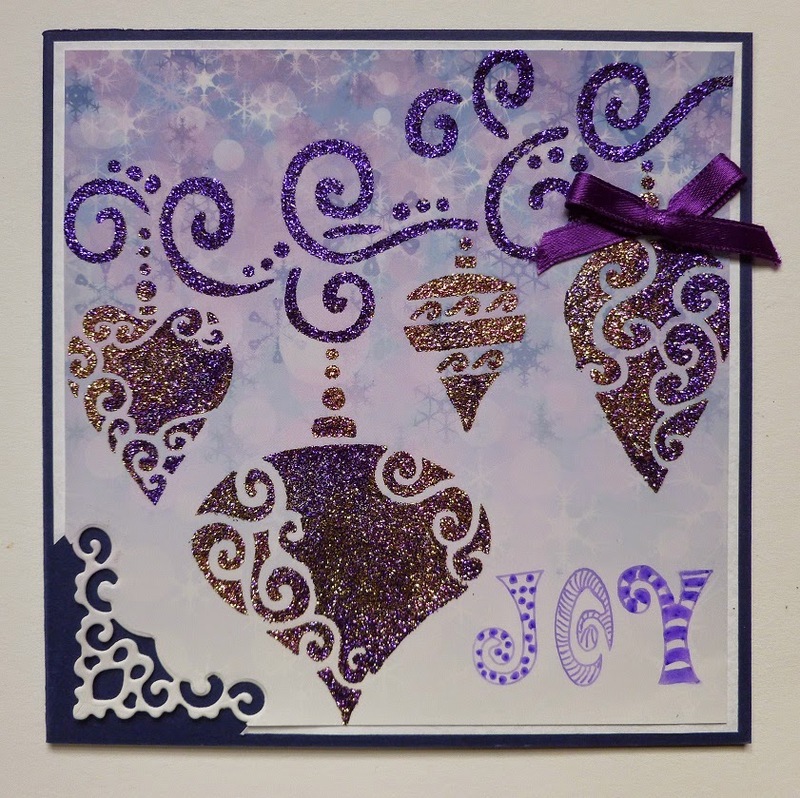 The finished card, a beautiful Christmas card. How are you all getting on with your Christmas cards? Have you started yet? Please share you creations with us on our Facebook page.